It is 1843. Mr. Jakub Pinkas, a tailor making for example vestments for a Franciscan monastery, has heard about a new beer which has just started being brewed in the Burgers’ Brewery in Pilsen. He makes a deal with his friend – the carrier, Martin Salzmann, who brings him two pails of this new Pilsen beer on April 8, 1843. Why was it that this beer was so different from the beers produced until then? It was made with a new method, which was the method of bottom fermentation, imparting the beer with an entirely new character and appearance. 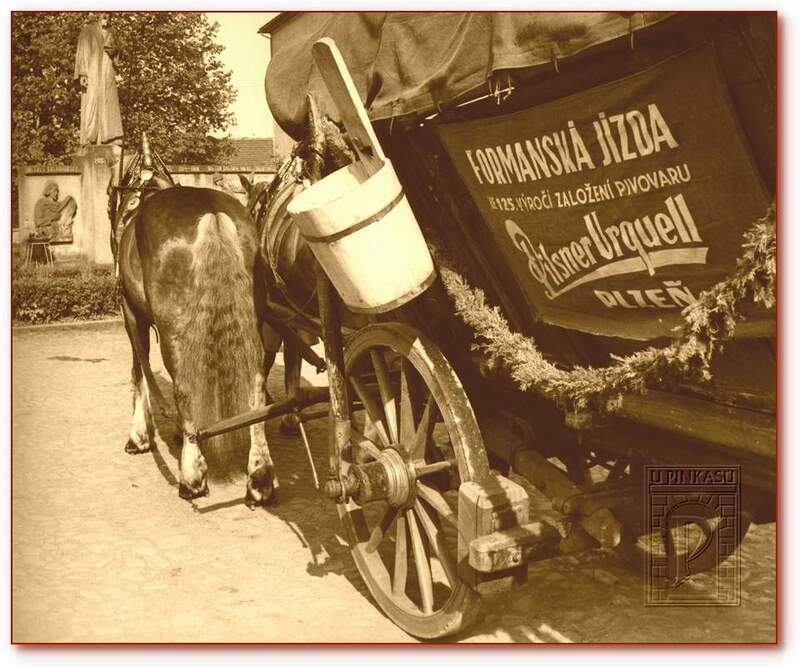 Jakub Pinkas was so enchanted by the beauty and uniqueness of this new Pilsen beer that he let his friends among honourable Praguers taste this beer and also all the hansom cab drivers from the rank which was located on what is today’s Jungmann Square. 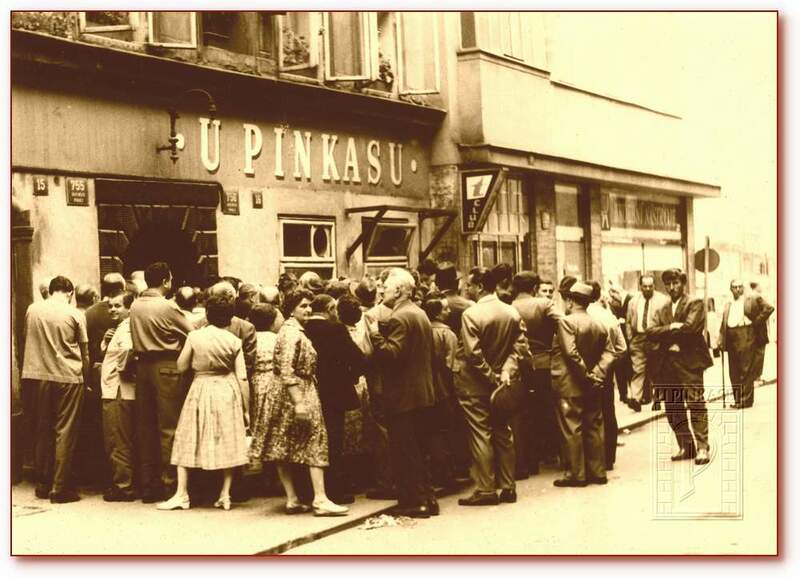 And since they were all charmed by it as much as Pinkas and they wanted to taste it again and again and with more and more friends and acquaintances, Jakub Pinkas soon finished as a tailor and became a landlord, founding the tradition of the most famous Old Czech pub called U Pinkasu. Thanks to its uniqueness, quality of beer and method of drawing, the U Pinkasu Pub became almost immediately a centre of social and political happenings. More and more beer lovers interested in good quality Pilsen beer would come to the Pinkas bar resulting in the original premises of the tavern being insufficient in size. For this reason in 1876 the Pinkas family bought the neighbouring house No. 756, a structure with a Classicist style façade but older interior constructions. The vast Gothic cellars of this house reach as far as the grounds of the former convent of White Friars and above them is brickwork originating from the Baroque reconstruction with the preserved Renaissance portal facing the street. From 1882–83 the restaurant was run by the Brabec family and until its nationalisation the restaurant was called “Brabec U Pinkasu Pilsen Restaurant”. Mr. Brabec was a reputable landlord. For a long time he was one of the oldest members of the Central Gild of the Czechoslovak Publicans’ Trade, called “Hostimil”, where he was engaged for more than 50 years. A great number of famous personalities used to visit the tavern. The first entry in the visitor's book from the thirties and forties bears the signature of the territorial prelate Barnabáš. Furthermore there are signatures of actors, dating back to 1935, such as Zdeněk Štěpánek, Ladislav Pešek, Josef Gruss, Ludvík Veverka, and the writer František Langr. Unforgettable sentences were added also by Messrs. Voskovec and Werich and their colleague Jaroslav Ježek. As to more modern history one must name the writer Bohumil Hrabal, who used to visit extremely regularly. He would meet his friends there and give them his samizdat books. Frothy beer glasses have heard many tales in our country. Amusing stories, remembering the good old days, or even serious debates of social and national importance. 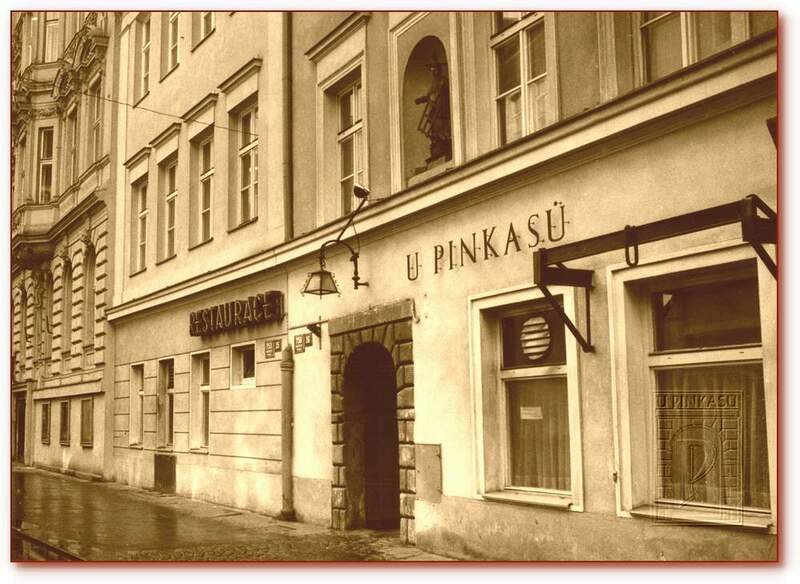 And it was the U Pinkasu Restaurant that in the second half of the 19th century became the centre of Czech patriotism, where renowned politicians and other giants of our history, such as František Palacký, František Ladislav Rieger, Josef Jungmann, T.G. Masaryk, Jan Masaryk and many others used to meet. After 1989 the heirs of the last owner František Brabec put in their restitution claims. At the end of 1991 having carried out building adaptations they opened the U Pinkasu Restaurant once again and ran it until mid 2001, when the entire complex was bought by the Adria-Neptun spol. s r.o. company. Its business plan is to follow up the famous history of drawing Pilsen beer at U Pinkasu and create there a pleasant environment for all those who like good beer and classic Czech cuisine. Pilsner Urquell has been drawn here for nearly three centuries and the beer volume will undoubtedly reach the same figures as before the reconstruction. According to written records, guests drank here about six thousand hectolitres. It is as much as in the famous U Fleků Brewery, however it has five times more seats for guests. The reason for such vast consumption was simple. Some people came to the Pinkas establishment for a drink or two, but record holders counted their daily amounts in tens of half-litre glasses. The pub’s record is over one hundred half-litre measures in a single day.